Flowering Date: Late spring into fall. 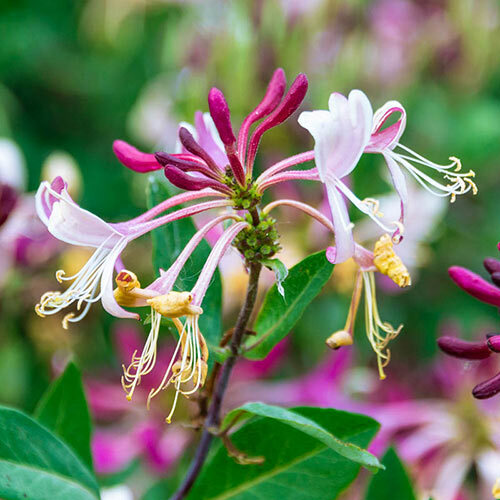 We discovered this outstanding new honeysuckle in the Polish nursery of Dr. Szczepan Marczynski—what a find! It produces masses of large blooms over an unusually long period from late spring into fall, and the blooms cover the plant all the way to the ground. 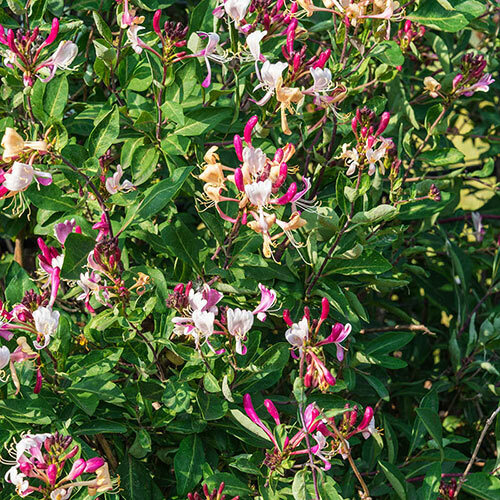 The fragrance is intense and sweet, a real delight when planted near a porch or window. Hummingbirds adore the sweet nectar of the multitude of ruby and cream blooms, while the bright red berries of late summer and fall feed robins, wood thrushes, bluebirds, sparrows and goldfinches. 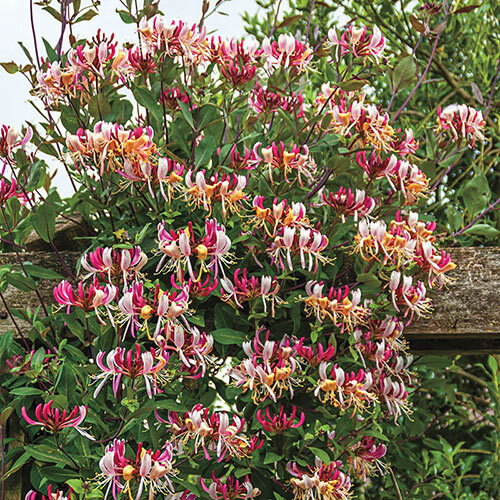 Unlike the sprawling Japanese Honeysuckle, this vine only grows to a compact 6-10', depending on the size of its support. An excellent choice to grow on a fence or trellis, once established, this tough vine needs no care. 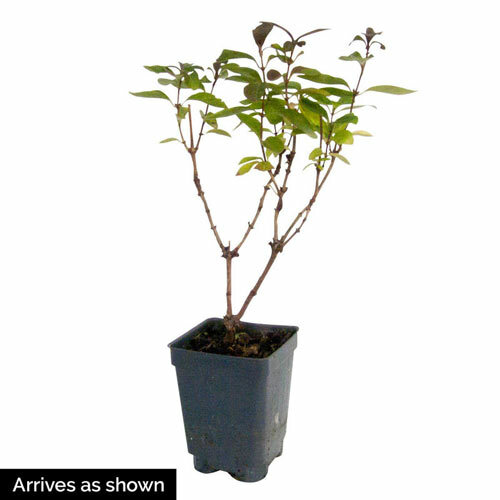 Lonicera periclymenum 'Chojnow' PBR. Flowering DateLate spring into fall. Planting InstructionsLikes partial shade in most regions except the far north, where it can enjoy full sun. Flower FormSmall tubular or funnel shaped. ResistanceNo pest or disease problems. Soil RequirementSucceeds in moderately fertile soil as long as it's not too dry or acid. Unique CharactersticsNew variety from Poland which is intensely fragrant. Has a compact habit, very strong coloration, very long flowering period. 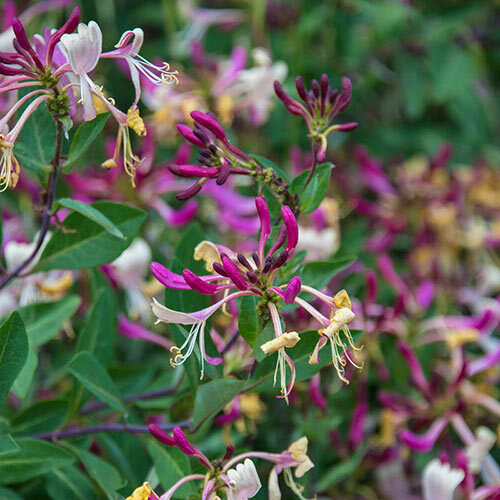 This Lonicera is very floriferous and will be full of flowers from top to bottom in summer.